Working as a school janitor is not easy. It’s a good thing that 55-year old Carl Villeneuve no longer has to work, and he has the lottery to thank for it. 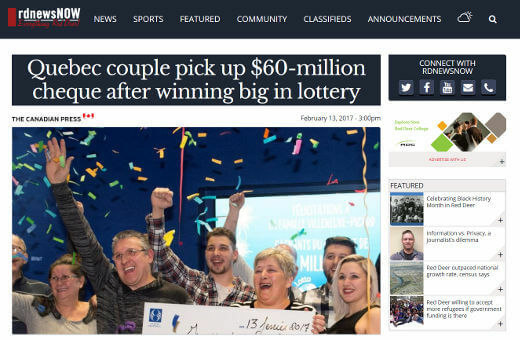 Villenueve and his wife Marie-Josee Picard have just posted a huge $60 million win in last Friday’s draw of the Canada Lotto Max. While the happy couple don’t have any plans yet for all the money they have won, Villenueve has already called his boss to quit. The pair are far from rich and Picard is a cook. She no longer has to work too, but has not indicated what her plans about her job are. For now they are thinking of buying a big home and taking a few vacations. And the rest of the money will go to their family; they have three children who are now in their twenties and a two-year old grandchild. The couple are from Saguenay, which is about 200 kilometers north of Quebec City.